NBC may be opposed to bringing back "The Sing-Off" but Steve Harvey sure isn't. 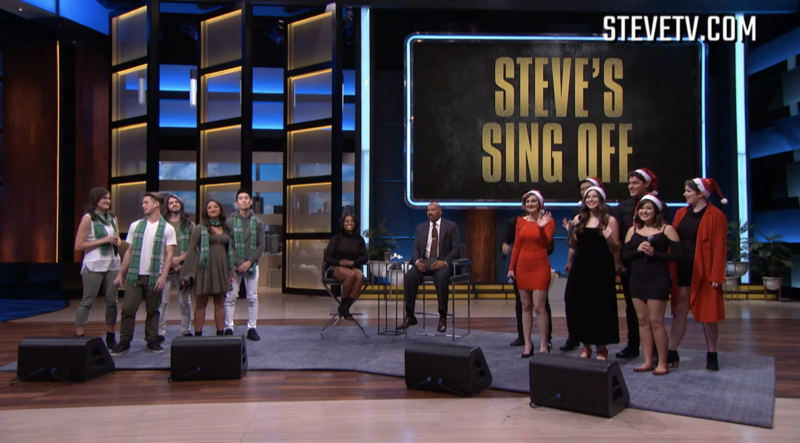 In a segment aired yesterday on the talk show Steve, Steve Harvey invited two a cappella groups to compete in "Steve's Sing Off" a sing off-styled contest, for a chance to win tickets to the premiere of the soon-to-be-released film "Pitch Perfect 3." And who better to help judge the competition than one of the stars of the film, Esther Dean. Steve Harvey invited aca-groups UCSB's Naked Voices and Backtrack Vocals to take part in a three category competition performing short segments of popular songs. It was a classic east coast versus west coast showdown, with memorable moments that included a touching rendition of "Have Yourself A Merry Little Christmas" by Naked Voices and a groovin' take on "Signed, Sealed, Delivered I'm Yours" by Backtrack Vocals. Could this mark the return of a cappella singing competitions to American television? Probably not, but we're excited nonetheless that someone is giving it its time in the spotlight.